All you need to know about the current state of the fiscal cliff negotiations is that Republicans are scorpions and Democrats are frogs. The scorpion’s sting is, of course, the House GOP’s refusal to pass even House Speaker Boehner’s “Plan B” limiting the scheduled Jan. 1 tax increase to income above $1 million. This act of self-destruction invites a bigger automatic tax increase. But Republicans just can’t help themselves. The House GOP's refusal also increased Obama’s leverage, because in Washington’s version of this fable, the frog (President Obama) shakes the scorpion off his back, swims to shore, and lives happily ever after. Only the scorpion drowns. It wouldn’t be the first time we’ve observed that this is one lucky frog. Sen. Joe Lieberman insists on sticking to the original version of the tale. If America goes over the fiscal cliff, Lieberman said Dec. 23 on CNN’s State of the Union, “it will be the most colossal, consequential act of congressional irresponsibility in a long time, maybe ever in American history.” We all drown! But that isn’t true. It will merely be the most colossal, consequential act of Republican self-sabotage in a long time. President Obama left Washington for his Christmas vacation in Hawaii urging congressional leaders to put together a stopgap deal blocking the Jan. 1 sequester (i.e., steep budget cuts), extending unemployment benefits, and allowing the scheduled Jan. 1 tax increase only on income above $250,000. That isn’t going to happen. 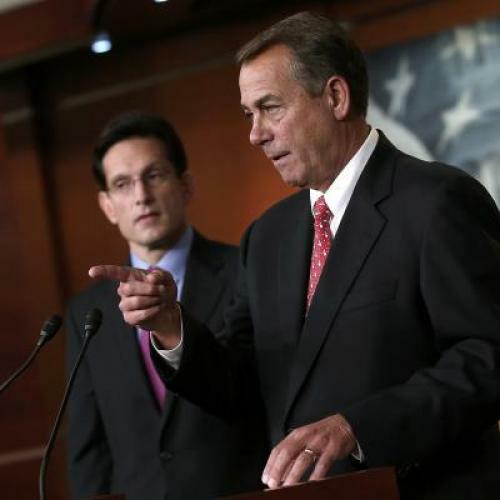 We know it won’t happen because Boehner couldn’t get enough Republican votes behind his much more GOP-friendly Plan B. Conceivably Boehner could try to put together a coalition of Democrats and Republicans to pass Plan B, but that would put his speakership (which is up for renewal in a couple of weeks) at serious risk. Also, what would be in that for the Democrats? Much better to wait till Jan. 1, when Democrats can dare Republicans to oppose what by then will be a tax cut for incomes below $250,000. The same automaton-like behavior that kept House Republicans from supporting Plan B will compel them to vote for a tax cut after Jan. 1. It may not be Obama’s tax cut. It may not even be Obama’s ill-conceived compromise version of the tax cut, which raised the threshold to $400,000 and proposed Social Security benefit cuts at the very moment the president should have realized he was holding all the cards. But they’ll have to vote for some tax cut, and then it will be Obama’s job to wait them out until they vote again, this time for something more reasonable. I hope it’s Obama’s $250,000 threshold, but Obama may have blundered into accepting a threshold closer to $500,000. The pressure on Republicans ought to be so great that Obama can also forestall the worst of the sequester cuts and win extension of unemployment benefits and the payroll-tax cut and various low-income tax credits, including the Earned Income Tax Credit. I’m guessing he can shoehorn some stimulus spending in there, too, and win at least a two-year postponement of the next debt-ceiling fight. Remember, the automatic income-tax increase won’t be Obama’s only leverage; Obama also will have leverage involving less-publicized increases in the capital gains tax and the inheritance tax, not to mention automatic cuts in defense spending. As this interactive chart prepared by Time magazine’s Michael Crowley makes clear, Obama can put off most of the bad stuff through the month of January. In nearly every respect, the fiscal cliff poses no more of a threat than the Mayan apocalypse. The single exception is the stock market. It will almost certainly go bonkers. But even that will have a beneficial effect, because Republicans will take the blame for angering the gods of capitalism, and will have to work overtime to appease them. Here’s hoping Obama will have the fortitude to be a patient frog while the viper thrashes and drowns and Lieberman, the Washington Post editorial page, Erskine Bowles, and Maya MacGuineas all issue urgent pleas for surrender. Republicans’ vote against Plan B pretty much guaranteed they’d be cast as the bad guys, and may even have rescued Obama from his own premature concession. I know that sounds simplistic. But honest to God, sometimes life really can be this simple.